The Paris Town update allows players to complete new airport orders to unlock Parisian residential zones for their city. 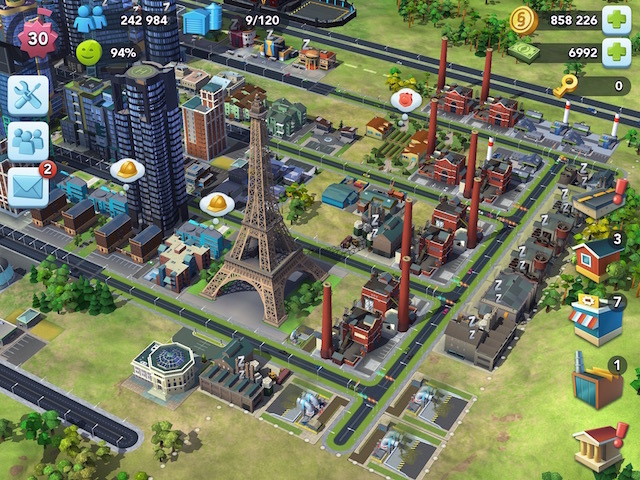 EA Mobile has released the latest content update in its mobile city-building title SimCity BuildIt: Paris Town. The Paris-themed update brings Parisian residential buildings, streetlights and signs to the game, as well as a new landmark. Players must have an airport in their city before they can build Parisian housing zones. The airport building site is located to the left of the town’s city limits, and requires 140,000 population to unlock. Once players have unlocked and constructed the airport, they can complete new Parisian shipping orders by filling cargo boxes with the required items. Players have a limited amount of time to fulfill each Parisian flight request, and will earn Simoleons for each box they fill. If players are running out of time, they can spend SimCash to purchase the remaining items. Or, if they’d rather skip the order altogether, they can request a new plane and a new order, which takes time to arrive. Players can also spend SimCash to speed up the appearance of this new plane. If gamers fill every box before a flight takes off, they earn a special French-themed neighborhood token used to build Parisian residential zones. Each of these Parisian residential zones produces 10 percent more citizens for one’s city, but also requires twice as many city services (water, power, etc.) as basic residences. Once players have 10 Parisian residential zones, they’ll unlock the new Eiffel Tower landmark. This building costs 40 Keys to build, and offers a 40 percent population boost to surrounding buildings. In addition to these Paris-themed additions, a visual enhancement has been added to the game. Now, when players build the Heliport, they’ll see helicopters fly around their city and land on helipad-supported buildings. SimCity BuildIt is available to download for free on the iTunes App Store, Google Play and Amazon Appstore.